I have been working on this project all week. It’s one of those things that I can’t really explain, I just couldn’t quit until it felt right. 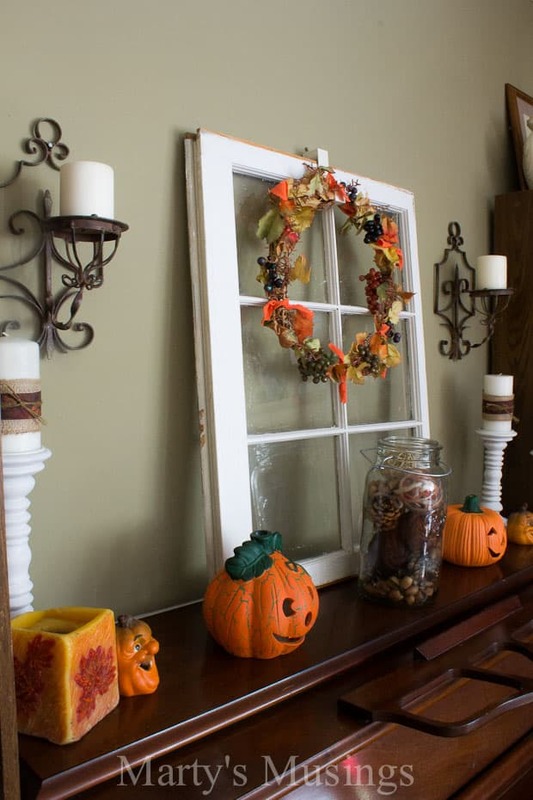 Earlier in the week I blogged on how I was struggling to come up with fall display. Fall isn’t really my season, as I am not really a fan of Halloween or orange pumpkins. But I do love a good Masquerade as much as the next person. Does this mannequin look familiar? It’s my garden head Betty Bling. Sometime over the summer, I had this vision of her in a feathered mask. Don’t ask me why. Recently, we were watching a wonderful performance of The Phantom of the Opera at the Royal Albert Hall on Netflix. I just LOVE the phantom. If you haven’t seen it, you really need to check it out. After we saw the Phantom, I instantly couldn’t wait to make my garden head Butch into the Phantom. He’s still got pizazz, I tell yah. So, once I started with THE PHANTOM, I came to the conclusion that Betty reminded me of Sarah Brightman, and I just couldn’t stop. The Masquerade had to be complete. I picked squashes, gourds and apples for the display, then added a few fun webs, crows and spiders. My kids didn’t get it. Betty got a makeover with a mask I doctored up from the thrift store. She also got some button eyes that I attached with a couple of straight pins. But other than that, she is still Betty at heart. I will have the mask tutorial on the blog tomorrow. Betty also got an upgrade with a cool piece of “make it yourself” jewelry I found at Hobby Lobby. She loves butterflies you know. Butch’s hair was kaput after the summer, so I pulled it out and added a striking black hat from the thrift store. He also got a phantom mask from Hobby Lobby and a button eye just for fun. At night, with the candles lit, they really do come to life. All I need now is a glass chandelier. Get a free tutorial for subscribing!